Essential pieces to create corners of social gathering and reading. Warm and cozy corners that will give life to all the rooms of your home. Polka dots of light for a wooden lamp of vertical silhouette.The ideal light to create a cozy and fun atmosphere. 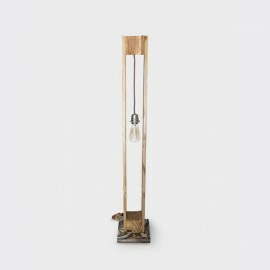 Vertical silhouette lamp, rustic and elegant.A standing lamp that invites us to the great pleasure of reading. The bricks of the base change according to availability.